Welcome to the 2018 Virtual Cookie Exchange! We’re so happy to participate in this fun event again this year. 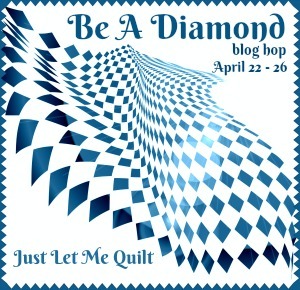 Thank you to our quilting friend, Carol, from Just Let Me Quilt, for organizing the blog hop again this year! 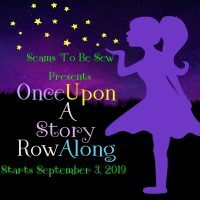 It is going to be SEW much fun! Our cookie recipe today is super easy to make, which is a good thing because they disappear quite quickly! Sharon usually ends up making two batches, one for our family to enjoy through the holidays and another to share with friends and neighbors. Can you think of a nicer gift than a plate filled with yummy cookies? You can substitute more chocolate chips for the M & M’s, if you like. If chocolate and more chocolate isn’t your favorite, then use butterscotch or vanilla chips instead. (I can’t imagine feeling that way, but different strokes for different folks, right?) I’m pretty sure that you won’t ever be disappointed in the results! 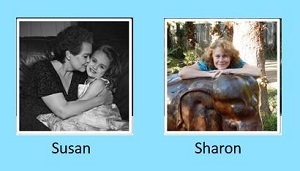 Susan made a set of pretty Christmas place mats for our Mom last year. 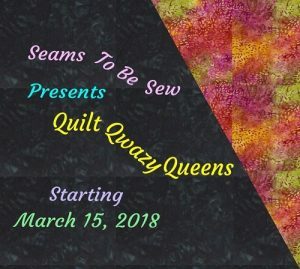 The piecing is easy, with just squares, rectangles, and half-square triangles. Susan used two shades of green, a pretty red, and a fun printed dot on white. Won’t this make a cheery Christmas morning table setting? And, if you won’t have time to make them before Christmas, just imagine how pretty they would be in pink, red, and purple for Valentine’s Day! If you’d like to make a set of the Christmas hearts place mats, you can purchase the pattern here in Ms P’s Pattern Shop! Thanks for stopping by today! We love to have you here for a visit, and we enjoy your comments! 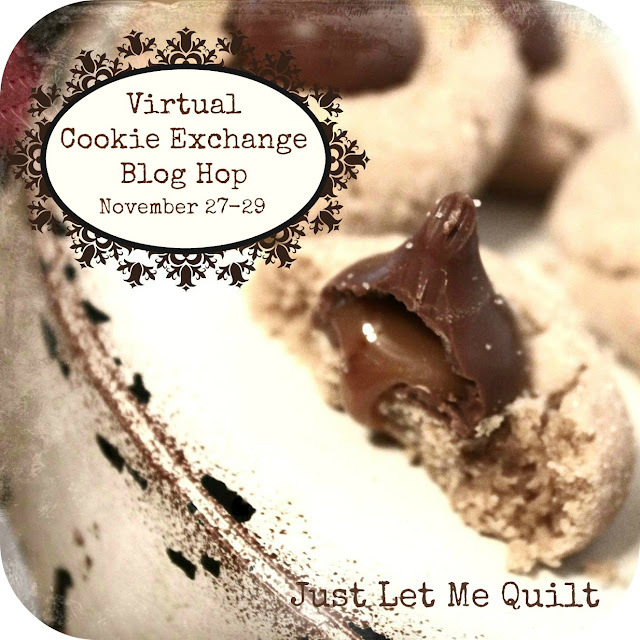 Don’t forget to hop on over to the rest of the blogs this week for more virtual sweets and treats! And here’s the list of participating bloggers! Your cookie bars sound yummy. Thanks for the recipe! That cookie, in all possible variations, sounds just delicious! Thank you for the recipe and the look at the project for your mom. I am sitting here just gaining weight reading all the wonderful recipes in this hop. Thanks so much for yours. It does look great, might have to try it. What fun placemats. A neat combination of ingredients, except for the coconut, they sound good. Thanks for the recipe. Cute table mat too. I love your quilted heart! Thanks for the cookie recipe! I eat at my desk at work a lot. I keep thinking that I need a placemat for every season — your would be a good place to start…. The Magical cookies sound like a great recipe for the kiddos to construct! Thanks for sharing! Chocolate and coconut in the same recipe is always a winner for me. Chocolate, coconut AND sweetened condensed milk!! YUM!! Oh, that recipe brings back memories! They are yummy, and it’s easy to understand why you can’t make just one batch! The placemats are so pretty and festive. I would imagine that those cookies would disappear quickly. YUM. I love those bars and what a great idea for changing out the colors for different holidays. Have a very Merry Christmas. I’ve never met a cookie bar I didn’t love. This sounds magical. Cute placemat too. I bet your mom loves them. Merry Christmas – thanks for the song too! Magic cookie bars have been a family favorite for 30+ years! I need to find some gluten-free graham crackers to make me some. 🙂 Thanks for sharing! Gosh they sound wonderful. and easy. That’s saying a lot since I really don’t do desserts other than from the bakery. Love the heart placemats too. Yum, yum. The cookies sound delicious. The placemats are so cute – I agree that they could be just as cute for Valentine’s Day with just a minor change in color. I know these bars as Magic Seven Layer Bars. They bring back fond memories of my growing-up years. Looks like a good cookie. Cute placemat. I too can not imagine anyone having a problem with MORE chocolate! Great recipe! Those cookies sound yummy! My friend makes a delicious one and I feel like she said it was Barefoot Contessa or Silver Palate. I’ll have to try to find out – they are soooo buttery. I love knowing that bar recipe….it is one of my favorites when I run into it! Bar cookies sound good, love your place mat. M&M’s included – YUM. I’m in.